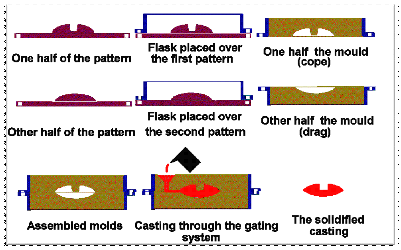 Home > News > Industry News > What is Sand Casting ? What is Sand Casting ? Sand casting, also known as sand molded casting, is a sand as a molding material of the metal casting process. 1） Place a pattern in sand to create a mold. 2） Incorporate the pattern and sand in a gating system. 4） Fill the mold cavity with molten metal. 5） Allow the metal to cool. 6） Break away the sand mold and remove the casting. Over 70% of all metal castings are produced via sand casting process. For example: gate valve, pump cover, cylinder head, … etc. XY-Global,design and manufacture mechanial parts for a decade.We enable any company, organization, or individual to design, price and order custom made parts. Here is our website: www.diecastingpartsupplier.com .